Inferior alveolar nerve (IAN) injuries may occur due to mechanical, thermal and chemical factors. Compression of the arterial blood supply of the nerve results in increased vascular permeability, edema and ischemia. Although in traumatic and ischemic injury to IAN, recovery occurs in 85-94% cases over 8 weeks,  yet prolonged compression can cause scarring and ﬁber degeneration. We present here, a case of an impacted permanent second molar tooth, causing facial pain due to compression of IAN. Sectional removal of the tooth was carried out to avoid injury to IAN. 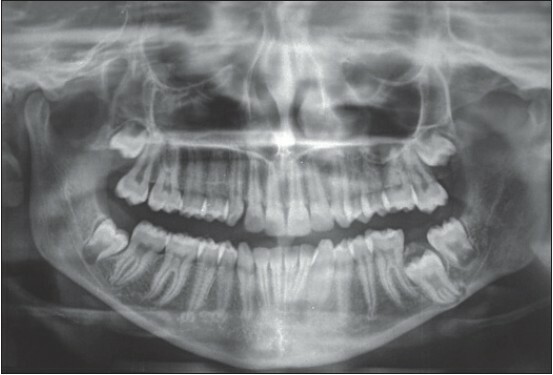 A 15-year-old girl presented with a chief complaint of pain in the lower molar tooth since 4 months. 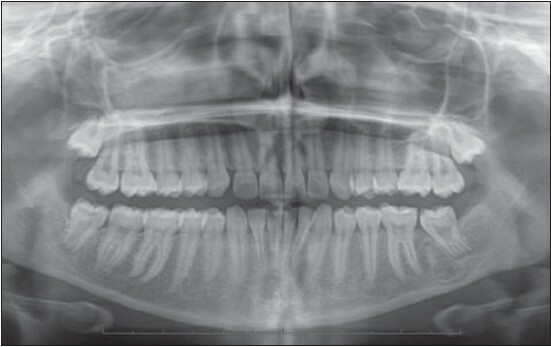 Pain was mild, continuous and located in relation to the lower left second molar tooth and radiated to the midline of the lower lip of the same side. Pain was not controlled with non-steroidal analgesics. The medical history was not significant. On extra-oral examination, there was no swelling or lymphadenopathy. An intra-oral examination showed a missing tooth 37. The overlying soft-tissue was normal. There was no anesthesia or paraesthesia in the distribution of IAN. 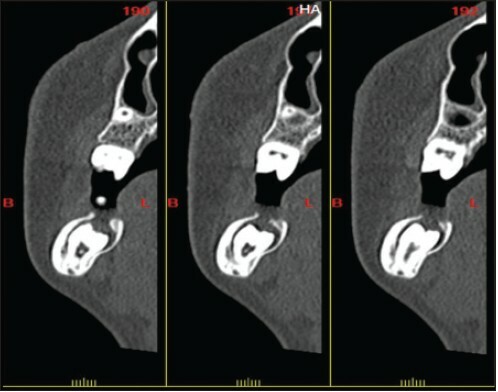 An orthopantomograph revealed an impacted tooth 37 with a distal hook-like angulation, the apical end of which had entrapped the mandibular canal [Figure 1]. Computed tomography (CT) with DentaScan (Siemens Somatom Definition Dual Source 64 Slice CT Scanner, Germany) showed a close association of the roots of tooth 37 with IAN [Figure 2]. After ruling out all causes of facial pain, a provisional diagnosis of IAN compression secondary to impacted mandibular second molar was made. The entrapment of the mandibular canal by the root of the impacted molar rendered repositioning of the tooth, by orthodontic means, impractical. Hence, surgical removal of the impacted molar was planned. 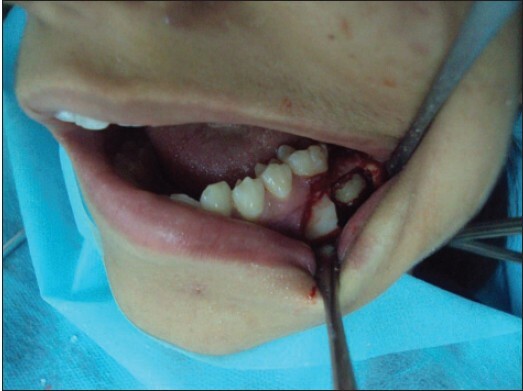 Mucoperiosteal flap was elevated and a window created on the buccal aspect [Figure 3]. The tooth was removed in sections to minimize injury to IAN. The coronal part of the tooth was horizontally separated from the radicular part and removed [Figure 4]. The roots were also split longitudinally and gradually elevated. The extracted tooth fragments were then reconstructed with wax [Figure 5]. The indentation produced by inferior alveolar canal was visible on the roots. A primary closure of the surgical site was done. 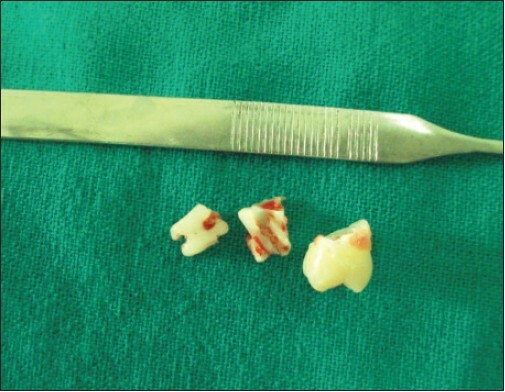 Mild local pain at the surgical site resolved completely on the 7 th post-operative day. The patient has been asymptomatic on subsequent recall. No sensory disturbances of IAN were encountered. A review after 4 years showed post-operative bone formation in the surgical site and mesial migration of the tooth 38-permanent mandibular left third molar [Figure 6]. Seddon classified peripheral nerve injuries as neuropraxia, axonotmesis and neurotmesis. Neuropraxia is a temporary loss of motor and sensory function due to blockage of nerve conduction without loss of axonal continuity. It usually results in transient paraesthesia of 6-8 weeks before full recovery. Axonotmesis is a disruption of nerve cell axon leaving the endoneurial and epineurial sheaths intact. It often results in paraesthesia and recovery usually takes months. Neurotmesis involves disruption of nerve and nerve trunk with the loss of anatomic integrity of epineurium, endoneurium and perineurium. Complete recovery almost never occurs. It often leads to anesthesia or dysaesthesia. In the present case, there was no loss of sensory function but signs of nerve compression were evident. Some of the radiographic predictors of IAN proximity to third molars include root darkening, root narrowing, root deflection and bifid apex while the canal may exhibit diversion, narrowing or loss of lamina dura.­  However, three-dimensional imaging accurately assesses the relationship of roots to IAN. Various surgical modalities have been proposed for teeth at a high risk for IAN injury. Motamedi suggested creating a buccal window, removing the crown followed by sectioning the roots mesiodistally. Pippi advocated vertical sectioning of the crown of third molar mesiodistally followed by gentle separation of the roots. Another proposed method is coronectomy particularly for vertical, mesioangular and distoangular impactions in close proximity to the IAN. This involves extraction of the coronal part of the tooth below the cement-enamel junction followed by reduction of the remaining parts at least 3-4 mm below the alveolar crest. This may permit root migration further from the nerve, which may eventually be extracted. Complications of coronectomy include neuropraxia, post-operative pain, infection and failure of the root to migrate. Furthermore, radiographs and dental CT scans may be required at intervals to assess the degree of root migration and treatment plan. In this case, extraction was preferred as symptoms of IAN compression had already set in. Moreover, root migration after coronectomy was not feasible as the roots had entrapped the canal. A buccal window was created and the crown surgically sectioned and removed. This was followed by longitudinal sectioning and gradual teasing out of the roots to avoid damage to the nerve. Signs of IAN compression should be considered as differential diagnosis among undiagnosed facial pains particularly when impacted lower second molars lie in proximity to the nerve. Identification employing 3-dimensional (3D) imaging and sectional removal of the tooth is indicated. IAN compression could cause unusual facial pain, particularly when impacted dilacerated lower second molar approximate the nerve. A thorough investigation of suspected cases involves 3D imaging. Early detection, timely intervention and sectional removal of the impacted molar is indicated to relieve the symptoms. 1. Scolozzi P, Lombardi T, Jaques B. Successful inferior alveolar nerve decompression for dysesthesia following endodontic treatment: Report of 4 cases treated by mandibular sagittal osteotomy. Oral Surg Oral Med Oral Pathol Oral Radiol Endod 2004;97:625-31. 2. Renton T. Prevention of iatrogenic inferior alveolar nerve injuries in relation to dental procedures. Dent Update 2010;37:350-2. 3. Seddon HJ. Three types of nerve injury. Brain 1943;66: 237-88. 4. Denio D, Torabinejad M, Bakland LK. Anatomical relationship of the mandibular canal to its surrounding structures in mature mandibles. J Endod 1992;18:161-5. 5. Littner MM, Kaffe I, Tamse A, Dicapua P. Relationship between the apices of the lower molars and mandibular canal - A radiographic study. Oral Surg Oral Med Oral Pathol 1986;62:595-602. 6. Tilotta-Yasukawa F, Millot S, El Haddioui A, Bravetti P, Gaudy JF. Labiomandibular paresthesia caused by endodontic treatment: An anatomic and clinical study. Oral Surg Oral Med Oral Pathol Oral Radiol Endod 2006;102:e47-59. 7. Loescher AR, Smith KG, Robinson PP. Nerve damage and third molar removal. Dent Update 2003;30:375-80, 382. 8. Motamedi MH. Impacted lower third molar and the inferior alveolar nerve. Oral Surg Oral Med Oral Pathol Oral Radiol Endod 1999;87:3-4. 9. 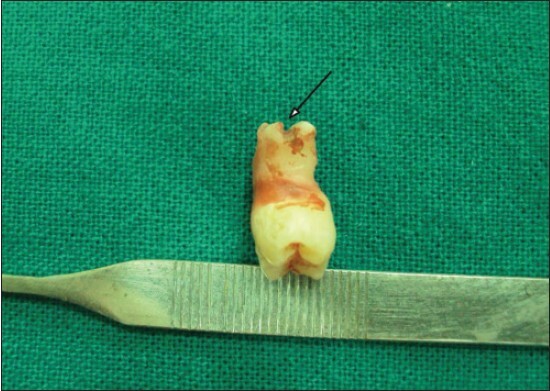 Pippi R. A case of inferior alveolar nerve entrapment in the roots of a partially erupted mandibular third molar. J Oral Maxillofac Surg 2010;68:1170-3. 10. Pogrel MA, Lee JS, Muff DF. Coronectomy: A technique to protect the inferior alveolar nerve. J Oral Maxillofac Surg 2004;62:1447-52.